The sophisticated 37 mm GV2 Berletta adds an air of suave elegance to any woman's wrist. 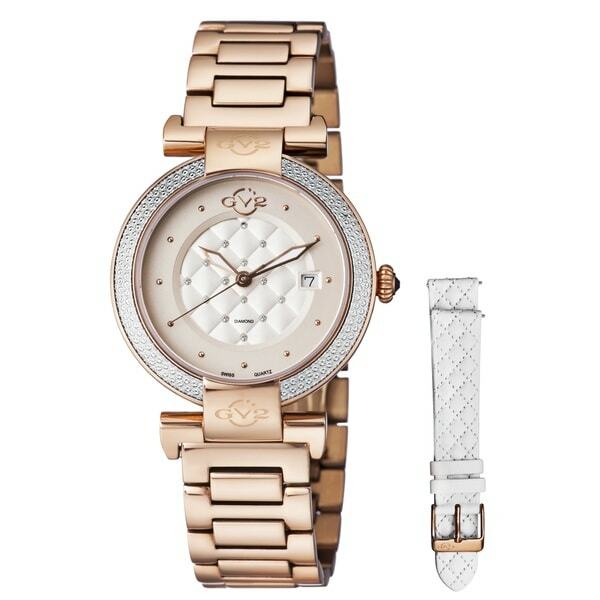 The timepiece features a clear white dial with a quilted pattern and 15 sparkling diamonds. This fine watch contains a rose gold IP stainless steel case with a blue cabochon on the crown and is adorned with a sparkling diamond cut bezel that immediately captures attention. Consisting of two interchangeable bands, a blue leather with quilted design and a two tone rose gold IP and stainless steel one, to always give you that look of elegance. Powered by a Ronda 705 Swiss Quartz movement this watch is a must for every woman.